Pontiac Solstice Forum > Technical Solstice Discussion > General Tech, Platform Common Issues & Solutions > 07 transmission querie. I bought my wife an 07 Solstice convertible a couple years ago.The AC stopped working so I put it on the ODB checker.It had the P0128 code so I erased it and the AC now works. The problem is that it had a bunch of Transmission codes pop up. I noticed that there is an inlet on the top of the transmission bell housing that has nothing attached to it. Is there supposed to be? I cannot find any loose vacum hoses nearby. is it just a plug that is supposed to be there? The codes are P0700,P0741. Any help is appreciated. Thanks. P0128 indicates that the engine did not reach the proper operating temperature. What is your normal coolant temperature? 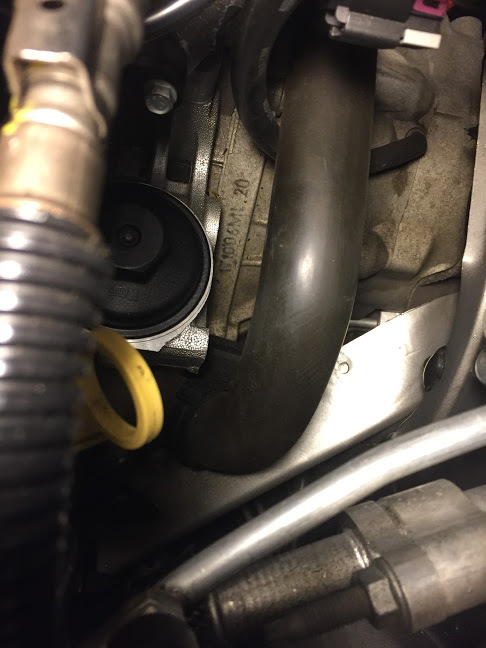 P0741 indicates that the Torque Converter Clutch is slipping, and is the cause of the P0700. The first check is for fluid level, which can only be done on a lift. Further checks are for fluid condition and the function of the control valves. I did not see anything that looks like your picture in the service manual, and do not have an automatic transmission to look at. Just chkd min 07 NA auto...mine appears to have a black rubber vent hose attached, which is leads straight up underneath the windshield wiper cover. It has has somekind of valve at the end. I figured that they would not leave an opening like that without at least plugging it. Thanks for the pic.Now I have a better reference for what I'm looking for. I am going to know where that hose goes to. It may be an accessory or something that her car may not have? I cannot find any loose hoses anywhere in that area. A location of whats on the other end might help. Rolliegla called it a vent, and that would seem to be what it is. The "valve" is probably a breather that is there to keep water from getting into the transmission. Replacing the hose is definitely a good idea, but the hose itself is not going to be the solution to your problem. The lack of a hose could allow transmission fluid to leak out, but the top of the housing looks clean, so that doesn't seem to be a problem. If water (or something) has gotten into the transmission and contaminated the fluid it could be responsible for the TCC not locking-up properly. If the codes return you should take it to a transmission specialist before you reset them so that they can better understand the cause. Resetting the codes also erases the freeze-frame data that is needed for the diagnostics. OK I think I have my answer. I stopped by a transmission shop nearby and showed it to him. He says it is just a breather for the transmission.It is just that there is no hose attached to it with a breather element.